Creative Crafts by Lynn: Wheeeee.......Spring Sprung! This image is from Squigglefly (Sassy Cheryl) and isn't she a cutie! I colored her up with Copics and framed her in a Lil Inker die. The patterned paper is from "somewhere" once again and the background is embossed with a Sizzix folder. That's all for today folks! I know what you mean about the heating bills. I think our lowest temp this year was 3 degrees one night. The heat never quits running on those nights. Oh my goodness! I love the look on her face! Fun image! CUTE card!!! Too cute! Love the stitched die you used to cut her out and your design is perfect for this sweetie. Awww she's a cutie Lynn! Fabulous coloring and I love that Lil Inker die!! Mesquite is all fine and dandy until it starts in with that yellow fuzzy stuff. I'm allergic to the color yellow! Cute card! It's fun and frisky. Oh my Lynn, I do so love this image she sure is a cutie. Beautiful background and loving the splash of yellow. Darling card! Love your colors and what a cute expression on her face! My gosh Lynn is that the cutest image, love her expression. Fabulous embossing, papers, and stitching. Adorable card and super sweet image! I really like the embossing folder you used for this cute gal! I'm just going to have to invest in one of those Lil Inker dies, because every time you use it, I think to myself I have to have one of those! It defines the image perfectly! Great coloring and embossing too, and enjoy your spring!!! I love all this white with the pop of yellow! So fresh and clean! Yep, pollen will be falling soon. I can see it coming on the trees and my eyes are already feeling it. Spring is almost here. She is just too too cute! Loving those knees!! She is a real cutie and looks great the way you colored her Lynn! I really like the diagonal embossing with her too. Boy we are supposed to hit the 90s the first of next week, going to be a VERY long summer around these parts!! That might be all for the day, Lynne, but it is a fun card beautifully made - love it!! She just made me smile when I looked at this cutie. Nice coloring job and it looks great with that embossing folder and the touch of color in your paper. So glad you are getting warmer weather. Oh I see a shopping trip to a craft store real soon in your future. We got a dusting of snow this morning. Beyond cute, Lynn! Things always work better when your tongue is out! wow, this is fabulous. Love the cute image and love the embossing. She is so funny, she made me smile and trust me that is just what I needed sooo. Another fun card and great image! She sure is cute! This image is so cute! It made an adorable, card...definitely brought a smile to my face! What a cute card!! I am looking forward to seeing a few flowers after all the darn snow we've had. LOL...I love the way you think, gf...every girl needs more craft stuff!!!!!!!! Love your sweet card with that adorable image and your pretty coloring..ya can't get any cuter than Sassy Cheryl!!! More money for crafting is always good!Staying warm at the same time is a real bonus! 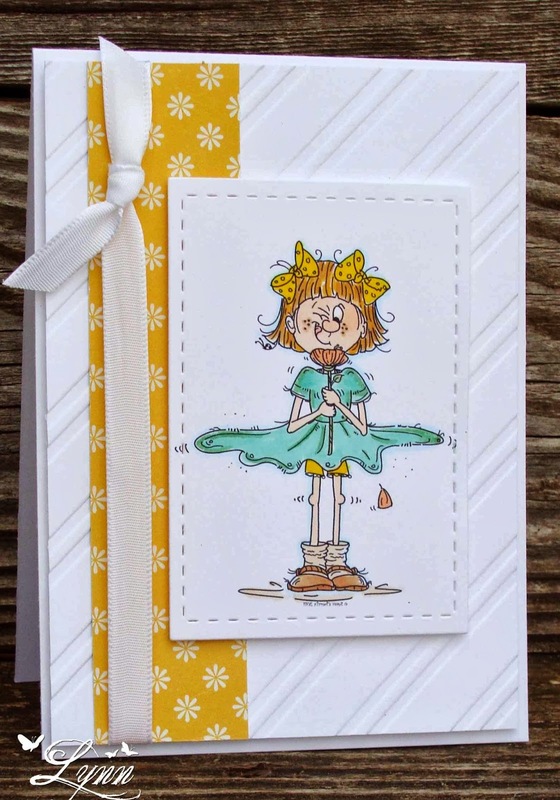 Super cute card Lynn~Love the yellows and your coloring is fantastic on this cutie pie!